As a floor choice, tile is a work horse. Tile is durable, long lasting, waterproof, and easy to clean. It's no wonder you see it in so many kitchens and bathrooms. But let's face it... in most of those rooms you're seeing basic, 12x12 ceramic tile in a shade of white or beige. Why not get a little more creative and turn that durable tile floor into a design statement? Kermans - Indianapolis's best tile store - has some ideas to help you see tile in a whole new light. Who says tile has to be 12x12? Or even a square for that matter! The size tile you choose can make that tile floor look completely different. Large format tiles, small tiles in a mosaic pattern or even tiles of mixed sizes can elevate your floor to a whole new level. You'll still be getting all the great, practical benefits of tile but you'll have them with a floor that enhances the design of your room. Sizes aren't the only things you can mix and match - how about colors? Try different shades of the same color for an interesting depth or go bold and mix dark and light. Getting creative with tile colors doesn't just add color to the room - it also evolves into a pattern. Patterned floors are very trendy right now and tile is one of the best ways to take advantage of this home design trend. Small rectangular tile - often called subway tile - is one of the most popular tile options on the market. 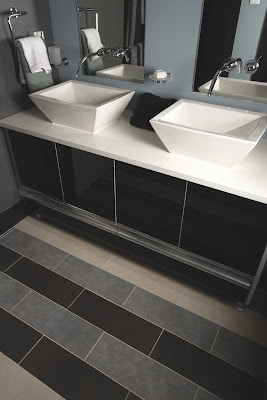 Typically laid out in a staggered horizontal pattern, subway tile lends a classic yet contemporary look to any room. What would happen if you turned those tiles vertically? Or perhaps laid them out in a chevron pattern? Your installation choice can turn basic white into wow. Pick the best tile floor for your Indianapolis home. When you find that right fit - don't stop thinking. Talk to a flooring expert at Kermans about creative options with size, color and patterns so your tile floor becomes a unique statement of your personal style.